This charming coach house, with generous garden, is being renovated and restored to create a stunning contemporary holiday home with stylish interiors and quality appliances throughout. The small fishing village of Orford is one of the special places in Suffolk where you can make happy memories with friends and family; enjoy big skies, excellent local food and a peaceful atmosphere. 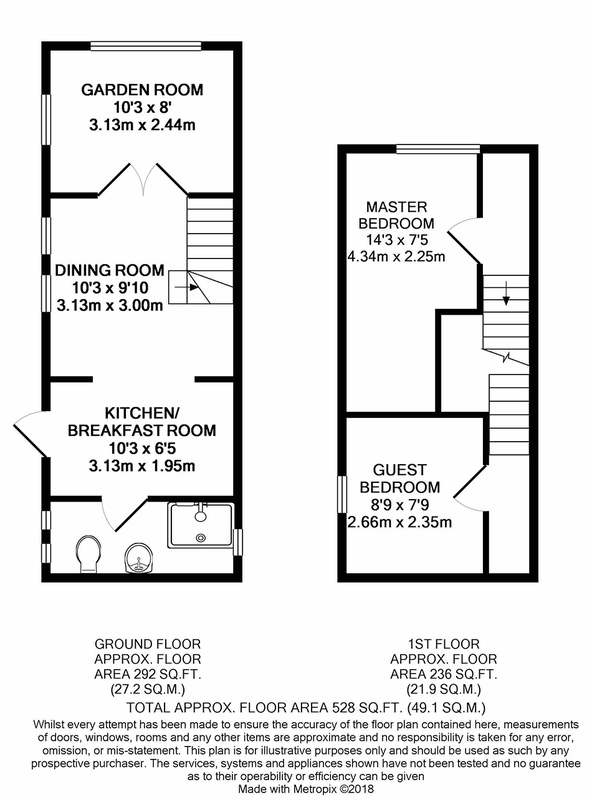 If you'd like a larger property take a look at the 'sister' house 115. THE COACH HOUSE WILL BE READY FOR GUESTS TO ENJOY FROM MAY 2019. PLEASE COME BACK TO THE WEB PAGE END OF APRIL TO SEE A FULL SET OF PHOTOS, AND GET IN TOUCH IF YOU'D LIKE MORE INFORMATION OR TO MAKE A BOOKING IN THE INTERIM. This characterful Grade II listed Coach House is being lovingly renovated and restored by the owners, who are working with the property to maximise the space, creating a light and airy open plan well-equipped kitchen/dining room with glazed garden room at one end, and modern wet room at the other. Stairs rise from the centre and split to the two bedrooms on the first floor, one with king size and the other with super king zip and link beds so you can decide if you prefer twin or double. Outside there's a long enclosed garden, primarily laid to lawn, with a shingle drive and outdoor furniture so you can make the most of long sunny days. The drive is at the side of the house, with off road parking for one car. You're welcomed into the kitchen/dining room with the garden room through double doors to the left, wet room to the right and stairs rising and splitting to the two bedrooms at either side of the property. There's underfloor heating in all but the garden room on the ground floor. This will be a wonderful space to spend time with friends and family. The bespoke kitchen will have a Smeg cooker, Smeg freestanding fridge with freezer compartment, slimline ten piece dishwasher and half Belfast sink. Both the kitchen and dining area have wood burners so you're sure to be super cosy, and a circular table and chairs are being installed for meals at home. This lovely light conservatory style room will be furnished with a tasteful combination of three seater sofa, chairs and occasional tables. Stairs rise from the dining area and split with flights going to bedrooms at either side of the house. A charming room with a small balcony with an inverted bay window, is being furnished with a king size bed. Another charming bedroom with a Juliette balcony. The beds will be zip and link so you can choose between twin or super king. This detached holiday house has the added advantage of a fully enclosed garden with lawn where children can run around in the sea air. There's a shingle drive with space for one car to park off road. This self-catering holiday house is equipped with underfloor heating and appliances include a TV with FreeSat and Wifi. The kitchen is well equipped with Smeg oven and fridge/freezer, a washer/dryer and slimline ten piece dishwasher, plus a large capacity washer/dryer in the wet room. 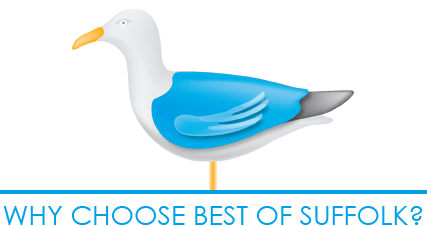 There are few places better on the Suffolk Coast to enjoy the blue skies and sunshine than Orford, a small fishing village known for its bounty of excellent local food and peaceful atmosphere. Arguably one of the prettiest villages on the Suffolk Coast, Orford is a true historical gem. From its castle, pretty cottages and welcoming pubs to the picturesque quay offering river cruises and the home of Pinney's delicious smoked fish and the Pump Street bakery, it’s an ideal place to while away a happy day or two. A well-behaved dog is welcome downstairs. If you wish to bring a dog it must be mentioned at the time of booking on the booking form and is subject to our conditions of booking. The garden is fully enclosed so well suited to little guests or dogs.